Summer season is here and you’ve got all the more reasons to take care of your tresses. During summers, we tend to sweat more, which leads to various skin and hair problems. Moreover, there are various other external factors like pollution, dust and chemical-laden products that contribute in making the hair dull and lifeless. If you are suffering from the problem of dry, rough and lifeless hair, then it is of utmost importance for you to manage and take extra care of your locks. You can do so by just invading your kitchen. Yes, you read that right! Indian household kitchens are a treasure trove of ingredients that are replete with health-promoting properties. Not only do they benefit the skin, but also the hair and the overall health. When it comes to hair care, one thing that has an essential role to play is hair mask. 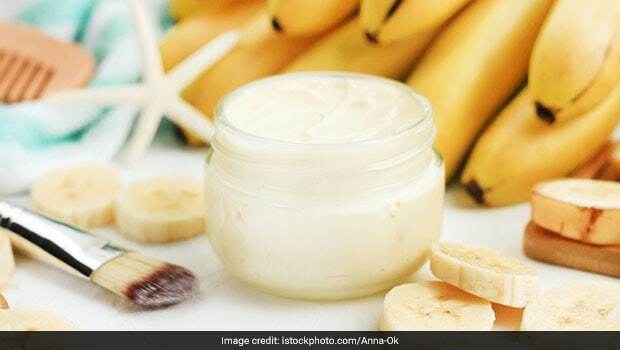 A hair mask prepared using three common ingredients like banana, honey and yogurt could do wonders for your hair. All the three ingredients mentioned above come loaded with nutrients that are essential to keep the hair healthy and strong. When combined together, this hair mask helps in bringing back the lost moisture of the hair and makes them look lively and bouncy. This hair mask is perfect for dull and lifeless hair; thanks to the presence of honey in it. Honey acts as an excellent moisturising agent and is also anti-bacterial in nature. It can help keep frizzy hair at bay and would further make them smooth and manageable. Likewise, yogurt and banana too are nutrient-dense and when applied topically along the length of the hair, these two ingredients have the potential of reviving the lost sheen of your tresses. Yogurt is dense in calcium and its high vitamin D content makes it all the way more beneficial for dry hair. Bananas are packed with the goodness of antioxidants and its high potassium content helps in imparting a shine on the top layer of the hair. To begin with, take a bowl and add banana to it. Mash it using a fork or spoon and then add in honey along with yogurt to the bowl. Blend together all the ingredients in a blender till a smooth paste is formed. Now, apply this hair mask along the length of your hair from top to bottom. Allow it to stay for at least 20-30 minutes and then rinse it off using a mild shampoo. All the ingredients mentioned above are readily available in the kitchen most of the time. Just bring together all of them and get back your hair’s lost sheen.